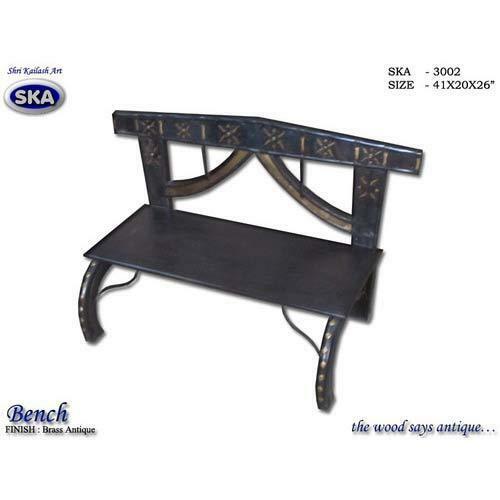 Being a well known manufacturer we are manufacturing and supplying the attractive and durable Antique Bench. These products are the benches which can enhance the beauty of the house, garden, office and hotels. We have goodwill in the market of supplying the high grade products. Our products are provided with smooth finishing so that they provide satisfaction to our clients. Shri Kailash Art came into existence in the year 1994. Based in Jodhpur, Rajasthan, the company is engaged in Manufacturing and Exporting a wide array of Metal Furniture and Decorative Items. Under the able guidance of our Owner Mr. Jagdish Jangid, the company has achieved tremendous success. His in-depth experience and wide knowledge in the respective sphere of work has enabled the company to attain a solid market position. Our aim is to popularize Indian art and craft in the international market so that our rich Indian culture and heritage are showcased in the form of our wooden furniture and artifacts. We aim to offer products that not only showcase the rich Indian art and craft but also enhance the interiors of various homes. We have a well-knit infrastructure. Making use of our latest sophisticated machines, we offer a gamut of wooden furniture items. We ensure that are machines are tested on timely basis and are upgraded to avoid interruption in the productivity of the range. Our clients have been the key to our success as we have delivered them the best services and focused on satisfying their requirements. We ensure that our range is produced in such a manner that satisfies the needs of the clients. We take care of the quality of our products, and ensure that the items are delivered to the client within minimum stipulated time period.